Try your luck at some great crappie fishing this fall. For more information on this species, visit the Michigan Fish and How to Catch Them webpage. Lake Erie: Perch fishing continues to get better as water temperatures cool. Fish have been caught out from the River Raisin and north to Stony Point in 20 to 24 feet. 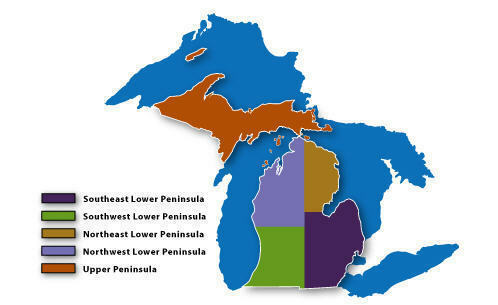 Most of the limit catches were reported out near the Michigan/Ohio line. Detroit River: has not changed much. Perch are still being caught south of Celeron Island and Sugar Island by those using minnows and perch rigs in 10 to 12 feet of water. As for walleye, few have been caught. Lake St. Clair: has good perch fishing for those using minnows. Some say the smallmouth bass are chasing the schools of perch away. Muskie fishing has been good and should continue to improve as water temperatures drop. Smallmouth bass fishing was slow but some were caught in shallow waters. St. Clair River: Walleye fishing has been good in the river and the channels. Some limit catches were taken up near Port Huron. Catch and release sturgeon fishing has been good in the North Channel. Lexington: Salmon are rolling and jumping in the harbor but they will not bite. Port Sanilac: Boat anglers out trolling reported warm water temperatures at least 90 feet down. No fish were caught. A brown trout was caught on a spinner. Harbor Beach: A couple brown trout and one very dark chinook salmon were caught in the Edison Channel when casting rapalas. Saginaw Bay: A few perch were caught off the Pinconning Bar which is straight off Pinconning in 9 to 12 feet and off Linwood. A walleye and some channel cats were caught in the Hot Ponds which are just east of the mouth of the Saginaw River. On the east side of the bay, several shore anglers caught bluegill, crappie, rock bass and a few perch. Smallmouth bass were caught in Wildfowl Bay but most of the boats out there are duck hunters. Just north of Caseville, perch fishing was slow off Oak Point. Saginaw River: Fishing is slow and will probably stay that way for a few days after several inches of rain fell in the watershed. St. Joseph: A decent number of perch have been caught in 50 feet of water north and south of the piers. Pier fishing was slow. When they can get out, boat anglers have caught salmon in 90 feet of water. Kalamazoo River: Is producing chinook and coho up near the Allegan Dam. Some are casting spoons and spinners while others are floating spawn and crawlers. The occasional steelhead has also been caught. Grand River at Lansing: Salmon can be found, however the bite is slow. Very few were caught at Moore’s Park or the Point where the Grand meets the Red Cedar. The few caught seem to attack bright spinners with feathers. A few walleye were caught over at Moore’s Park and catfish continue to hit on live bait. Muskegon River: The recent rain did help to push what might be the last of the chinook salmon into the river. Anglers were starting to see some steelhead. Whitehall: Pier Anglers are taking a few steelhead on spoons and on spawn. Rogers City: Still has adult chinook salmon in and around Swan Bay. Try anchoring and casting spoons or body baits. Some are trolling high lines off boards with bombers. Pier anglers are getting a few when casting spoons or body baits in the early morning or late evening. Younger salmon have been caught halfway down in waters 40 to 90 feet deep with spoons. Hot colors are still green, white, purple, blue and silver, black and white or blue and green. Boats are fishing Swan Bay or north towards the State Park and Forty Mile Point. Presque Isle: Has good fishing straight out of the harbor between the red can and the lighthouses. A decent number of young chinook salmon have been caught by those fishing summer patterns halfway down in 40 to 90 feet and using the same colors as Rogers City. The key is to find the baitfish. Thunder Bay River: Has salmon. Many have turned dark and some are spawning. Catch rates were better in the evening or early morning before the sun comes up. Try spawn or crank baits. Harrisville: Salmon continue to trickle in and around the harbor. Most anglers are floating spawn or casting spoons just before daylight and throughout the evening. Wind direction makes a difference so watch for winds from the north to east. Oscoda: Salmon have been caught off the pier, but again seem to be coming in and out of the river. The majority of fish seem to be fresh. Au Sable River: Few salmon have made it up into the river. Anglers are hoping rain will cool the water temperatures and improve the flow. Tawas: Those fishing from the pier and inside the harbor have caught a few small perch and some rock bass. One angler did catch a 26 pound chinook salmon. Tawas River: A few salmon were caught in the lower river at night. Au Gres: Perch fishing was spotty but a few decent catches were taken in 45 feet of water off the Northport Marina, which is just to the north of Au Gres. Au Gres River: Anglers fishing the East Branch can be found near the Singing Bridge. Salmon can be seen in the surf and the lower river however they will not bite. Petoskey: Had dredging in the marina. The boat launch has been closed and the dock has been pulled out. Those surfcasting inside the breakwall did manage to catch a couple salmon on crank baits. A couple steelhead were caught on spawn. Bear River: Has a lot of salmon after the recent rains. Anglers caught mainly chinook followed by coho and steelhead. They are using flies, skeins, spawn bags or yellow and green yarn. Charlevoix: Boats are fishing inside the Cement Plant breakwall and into the boat slip. Most are casting crank baits or spoons but some are still-fishing with spawn. Smallmouth fishing was good in the channel. Try crawlers or leeches. A lot of anglers are salmon fishing near the Medusa Weir. Catch rates were up after the rain. Anglers wading near the slip did well with spawn during the day. Those fishing at sunrise and sunset did best with crank baits in a green tiger pattern. Those fishing at night used anything that glows. Traverse City: The East Bay is producing smallmouth bass for those using live bait or plastics. Cisco have also been caught. In the West Bay, anglers have caught smallmouth bass and perch. They are fishing along the edge of the weeds with minnows, wigglers or shrimp. Those putting in the effort to locate the fish and stay on them have taken some decent catches of perch ranging 8 to 10 inches. Elk River: Chinook and coho have been caught near the power dam. Coho were hitting on small spawn bags and the chinook were hitting on skein, spawn bags, deep diving crank baits and beads. Boardman River: The chinook salmon run is nearing the end. Those drifting skein under a bobber were still picking up the occasional fish. Anglers are reminded that snagging is illegal. Look for coho and steelhead to start moving in. Platte Bay: Fishing in the bay has slowed as most of the fish are now up into the river. Those surfcasting with spinners or spawn have still caught the occasional fish. Platte River: Chinook and coho have been caught below the weir and the canoe landing. Try yarn flies or rubber eggs. Frankfort: Boats heading out in waters between 190 to 250 feet and trolling 80 to 120 feet down caught coho and young chinook on spoons and plugs. Pier anglers at Frankfort and Elberta have caught steelhead on fresh spawn. Betsie River: Still has a good number of chinook salmon but many are now quite dark in color. Onekama: Dredging should be done sometime this week. Coho could be seen off the north pier but the fish were not willing to hit. Portage Lake: Is producing some good catches of large and smallmouth bass. Perch and bluegill fishing slowed with the change in weather. Manistee: Boats are catching chinook and coho salmon 80 to 130 feet down in 120 to 200 feet of water. Green flies and blue spoons have been working well. Steelhead action is slow off the piers and surf. Manistee River: The recent rain pushed some steelhead into the river. Anglers are fly fishing or using spawn. Ludington: A few steelhead and salmon have been caught in 100 to 200 feet of water. Steelhead have been biting on orange spoons higher in the water column. Salmon have been coming 70 to 100 feet down on blue spoons or flies. Pier anglers targeting steelhead have found the action to be slow but it should pick up soon. Pere Marquette River: Is still producing some big chinook though many have turned dark. A couple steelhead and a few brown trout have also been caught. Pentwater: Pier anglers are reporting catches of brown trout, steelhead and coho salmon on spawn. Keweenaw Bay: Those casting spoons from Sand Point and out from the L’Anse Marina have caught coho. Those fishing Traverse Bay might find leaving a little more difficult as the last storm pushed a lot of sand into the harbor. River fishing around the bay has started to pick up with coho caught on a daily basis. Marquette: Boat anglers had good action with three to five fish and some limit catches of coho taken outside the lower harbor breakwall in 40 to 50 feet or trolling near the mouth of the Carp River and the Chocolay River. Those fishing off the breakwall caught coho and lake trout. The coho are not quite ripe yet and the lake trout are still a couple weeks away from moving in close for spawning. The fish cleaning station in the Lower Harbor is closed for maintenance. Dead River: The pink salmon are done spawning and the chinook salmon have moved into the area. Fishing pressure has increased as several chinook have been caught. Carp River: Has good action with anglers catching good numbers of coho and the occasional steelhead. Early morning is best with stick baits, crank baits, spoons, crawlers and spawn bags. Chocolay River: Boat anglers are averaging zero to five coho. Shore anglers and those wading had good action with one to five fish per trip. They are using spoons, spinners, small stick baits or spawn bags. Menominee: Those targeting trout and salmon were casting spoons off the lighthouse pier. The marina pier is closed to fishing due to work being done on the docks and dredging. Menominee River: Most of the trout and salmon action has been just below the Hattie Street Dam. The fish are active but the catch rate was on the slow side. Anglers are drifting spawn or casting spoons and crank baits. Shore anglers have caught walleye, smallmouth bass, bluegill and perch when drifting crawlers near the Mystery Ship Marina and off Stephenson Island. Little Bay De Noc: Windy conditions have kept walleye anglers in the north end of the bay. Fish were caught but many were sub-legal. Perch anglers have done fair to good near the mouth of the Day’s River in 13 to 16 feet or east of Butler Island in 20 to 25 feet. Escanaba River: Shore anglers up near the 1st Dam have caught salmon when casting spoons, spinners and crank baits. The fish are turning dark as the season winds down. Big Bay De Noc: Due to windy conditions, perch anglers were not able to reach their destinations. Smallmouth bass action was fair as fewer anglers were catching them. Try just off the break in 10 to 35 feet between Garden Bluff and Snake Island with minnows, crank baits or plastics. Two Hearted River: Has coho, a few chinook and the occasional steelhead. The high water levels could make fishing a bit of a challenge however. Munising: reports a good amount of fishing activity over the past week. Boat angling effort has remained fairly active targeting coho salmon almost exclusively this week with fair to good results on coho with several limit catches being reported. Pier fishing activity has remained steady but slightly down from its peak with anglers fishing various times of the day targeting coho and splake. Shore angling effort was very light but those trying reported fair to good results. Grand Marais: Shore anglers reported fair results this past week targeting coho salmon and steelhead at the mouth of the Sucker River. Steelhead were caught primarily on spawn under windy conditions while coho continue to be mainly caught while casting. St. Mary’s River: A few nice walleye were caught in Raber Bay by those drifting and trolling in the early evening up until dark. Use floatation devices to keep the crawler harness above the weeds. Hot colors were orange, chartreuse and yellow fire-tiger. A few smallmouth bass were caught on the north end of Munuscong Bay, east of Kemps Point, and on the south side of Moon Island. Try jigging tube baits near the rock piles in 14 to 18 feet. DeTour: The fish cleaning station is closed for the season. Drummond Island: Anglers are fishing for walleye, northern pike, and smallmouth bass. Yellow perch fishing was fair around most of the islands. Anglers are using shiners and wire spreaders in waters 14 feet or deeper. Perch 9 to 11 inches were reported off the south side of Harbor Island in 20 feet. Try jigging shiners just off the bottom. Cedarville and Hessel: Yellow perch have been caught on the east end of Hessel Bay, Snows Channel, and Musky Bay. Try crawlers or minnows in 6 to 11 feet of water. Pike fishing has been great for those still-fishing with chubs or casting into the weed beds in shallow water. Largemouth and smallmouth bass fishing remains excellent. Salmon can be found in Bush Creek and Beavertail Creek. St. Ignace: Boat anglers heading out have caught chinook and pink salmon. One angler was pleasantly surprised with a chinook measuring 40.5 inches. The action in Nunns Creek slowed but the rain should have pushed more fish into the area. Tip of the week: Be ready to hit the target this deer season! Get plenty of practice at a shooting range near you.